Audiences are hungry for all things eighties at the moment. From the neon stylings of Ryan Gosling thriller Drive to the breakout pastiche success of Netflix' Stranger Things, the era of synth and big hair possesses an irresistibly nostalgic appeal. Riding that wave of nostalgia is Steven Spielberg's new adventure Ready Player One, a fortuitous blend of filmmaker and subject. Given Spielberg defined the tone of the 1980s blockbuster with the likes of E.T. and the Indiana Jones movies, he's ideally suited to adapt Ernest Cline's bestselling 2011 novel, one exploring a treasure hunt located within the remarkable virtual reality landscape of the OASIS. Tye Sheridan stars as Wade Watts, one of millions of people around the world who's escaped the dystopian drudgery of real life by escaping into a vast game. Once inside the OASIS, users can become anyone and anything, but there's a twist. The program's deceased creator James Halliday (Mark Rylance) has left clues to his vast fortune located within the game itself, and a frantic, even deadly, contest ensues between Wade, his fellow gamers and the nefarious IOI corporation, headed up by Nolan Sorrento (Ben Mendelsohn), who wants to claim control of the OASIS for himself. Further upping the level of nostalgia is the fact Halliday has studded his creation with all manner of beloved pop culture creations - the OASIS is the kind of world where Back to the Future's DeLorean can race the likes of King Kong, while Street Fighter's Blanka can be seen propping up the bar with Lara Croft, and the Iron Giant charges into battle. The movie has drawn critical praise for its visually stunning motion capture effects sequences and fan-pleasing Easter eggs, even if it can't quite escape the narrative deficiencies of Cline's source novel. 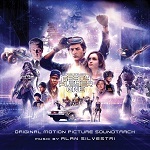 The movie's self-referential nature also poses an interesting challenge for composer Alan Silvestri, who becomes one of the coveted few to score a Spielberg movie other than John Williams. The latter was in fact down to score the film originally but parted ways in summer 2017, choosing instead to focus on the director's The Post. 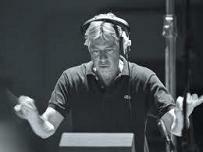 Silvestri's connection with Spielberg dates back to 1985's Back to the Future, on which the latter served as producer (and who recommended to director Robert Zemeckis that the score sound appropriately grandiose). Nevertheless, this is Silvestri's first score for a Spielberg-directed movie, and has subsequently drawn much attention. That the results are superb is hardly surprising. For one, Silvestri rose to prominence with his symphonic eighties scores, and so the chance for him to musically riff on the same period makes for inspired results. With Jerry Goldsmith and James Horner now having left us, he's one of our last remaining connections to a Golden Age of 1980s adventure music. And as we all know, Spielberg's attitude towards music is defiantly old-school, showing a willingness towards theme and melody and with a tendency to place the score at the forefront of the sound mix, allowing it to carry the emotional impact of the storyline. Sensibly, amid the clutter of the film's pop culture references and a narrative that spans both the real and digital worlds, Silvestri has opted to anchor everything in one recognisably overraching theme. Structurally speaking, this creates a sense of emotional purity, giving the movie a clear musical identity amidst all the action, a theme that celebrates retro geek culture and those who seek to protect it. The tone of the theme meanwhile is joyously warm-hearted, noble horns and optimistic strings bound to bring memories of Amblin's eighties movies surging back. It's music with a singular tone and purpose, designed to lock audiences firmly into a love of all things eighties. With definite stylistic nods towards Back to the Future and the Captain America march, the theme pervades the score, while striking a variety of different tones from rousing heroism to understated beauty. Its full presentations come during the 'Main' and 'End' Titles (structured at the end of the album), but its first appearance comes during the lovely 'Hello, I'm James Halliday', soft strings, winds and soaring choir (akin to The Abyss)alluding to the mysterious creator of the OASIS. Later on, the gorgeous 'Welcome to the Rebellion' calls to mind Silvestri's family scores like The Parent Trap, adding a sense of musical intimacy to the burgeoning relationship between Wade and fellow gamer Art3mis (Olivia Cooke). 'Why Can't We Go Backwards' begins with a wistful piano variation on the theme before those familiar Silvestri tremolo strings and horns take over with a defiant sense of purpose. Cannily, the track also incorporates elements of Back to the Future's 'Clocktower', underscoring a pivotal early chase sequence involving the aforementioned DeLorean, before building to a triumphant climax. 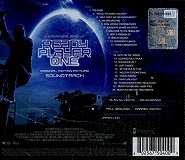 (Further quotations of Back to the Future theme come in the later set-piece "Hold Onto Something" while Silvestri's 'DeLorean Revealed' cue, with its signature spine-tingling celeste, makes a sly cameo in 'Real World Consequences', the reasons for which are abundantly clear in the film.) Further beautiful variants on the theme come at the string-laden start of 'High Five Assembles' and, especially, the breathtaking "What Are You" and "There's Something I Need to Do", pieces of tear-jerking majesty to stand with Silvestri's best. Of course, much of the score is occupied with action, and this is where the Silvestri of Predator, Volcano and any number of other classic action scores returns to the fold. It's heartening to note Silvestri's musical signature hasn't left him with the octactonic scales, prominent xylophone, snare drum clusters, jabbing strings and brass onslaught all making their presence felt. 'Real World Consequences', 'Sorrento Makes An Offer', 'High 5 Assembles' and 'Sorrento Punked' all impress, but are a mere entree to the utterly spectacular finale that accompanies the film's closing battle on Planet Doom. 'Looking for a Truck' kicks off with the familiar sense of Silvestri freneticism, the aforementioned orchestral stylistics mixing with signature horn blasts of the main theme to remind us of what the main characters are fighting for. 'She Never Left', 'Last Chance', 'Wade's Broadcast'. "Get Me Out of This", "Hold Onto Something" and "This is Wrong" strike exactly the right sort of tone for the movie, a symphonic onslaught that grounds everything in orchestral, rather than electronic, might. That said, there are moments of electronic percussion in 'Orb of Osuvox' (which contains more powerful choral work), 'Sorrento Punked' and the relentless, tension-building strings of 'Arty on the Inside'. However, such contemporary licks (reminiscent of Avengers Assemble) are tastefully deployed, and never overtake the orchestral impetus. More than anything, it's clear Silvestri is having a lot of tongue in cheek fun with his first Spielberg collaboration. The opening cue, 'The OASIS', deploys faux-portentous lyrics to musically draw us into the game, a successful aping of the style heard in the likes of Civilisation. The amusing 'An Orb Meeting' calls to mind Mouse Hunt with its playful double bass and bassoon undercurrent, an effective way of sending up the incompetence of central baddie Sorrento, who claims to be versed in Halliday's love of pop culture when in fact he's anything but. And there's a musical Easter egg lurking with 'Hold Onto Something' in the form of Akira Ifukube's original Godzilla theme, another clever allusion to one of the film's pivotal battle sequences. Much as it's tempting to write off Ready Player One as a mere wallow in nostalgia, the movie does have a big heart, championing a period in history that gave rise to a rich plethora of games, music, literature and cinema. Silvestri's score follows suit, interweaving around the inevitable needle drops (including the likes of Van Halen's 'Jump') to craft both a sweet homage to his own style and a robustly entertaining adventure score in its own right. Both he and Spielberg are careful not to overdo the self-referentiality: they instead realise that by spotting the music carefully, and by grounding everything in a comforting air of melody and harmony, the music will work almost alchemically on the target audience. There's no doubt it succeeds. In his first collaboration with Spielberg, Silvestri has delivered a cracking blockbuster score, and should John Williams bow out in the not-too-distant future, it's clear exactly who the director should call. The score album is available from these links at Amazon.co.uk and Amazon.com. Trivia note: though not on the film score album, there is a strong visual and musical reference to "The Shining".